Yoram Gross Film Studios. 26 x 30mins. ABC. 1992. Producer: Yoram Gross. "The Adventures of Blinky Bill" TV series is set in the surrounds of the Australian bush and stars a cast of fun loving and inquisitive characters. Blinky Bill, Nutsy Koala, Splodge Kangaroo, Flap Platypus and Marcia the Marsupial Mouse are all full of adventure and humor while bravely struggling against threats to their environment and taking care of each other. A 26 half-hour series for television. CD (ST) ABC. 8144312. 1994. 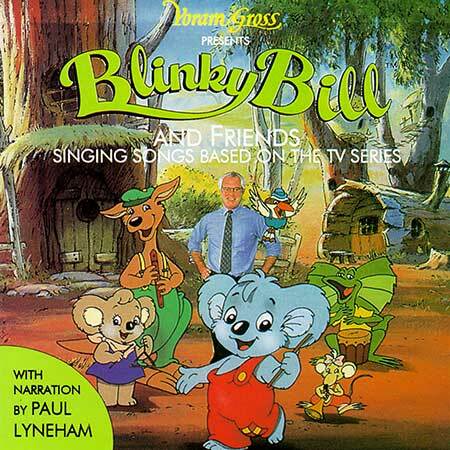 "BLINKY BILL AND FRIENDS - SINGING SONGS BASED ON THE TV SERIES". All Songs Arranged and Produced by Guy Gross. Performed by Robyn Moore and Keith Scott. Narrative Dialogue Written by David and Carol Witt and Performed by Paul Lyneham. Recorded at Guy Gross Music, Trackdown Studios, Sydney. Engineered by Simon Leadley. Assisted by Michelle Barry. Executive Producer: Geoff Watson. 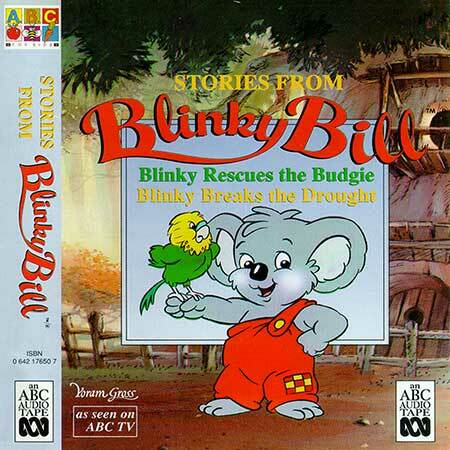 01: Hey, Hey Blinky Bill. (2:29). (G. Gross/J. Palmer). (Mushroom Music/YGFS). 02: The Good Old Days. (3:55). (G. Gross/R. Nobel). (Mushroom Music). 03: Blinky The Detective. (2:31). (G. Gross/C. Burmester/G. Eskin). (Mushroom Music). 04: Mystery Magic & Mayhem. (4:48). (G. Gross). (Mushroom Music). 05: Teaching Must Be Easier Than This. (3:21). (G. Gross/G. Watson). (Mushroom Music). 06: Lost In The Bush. (2:58). (G. Gross/C. Burmester/G. Eskin). (Mushroom Music). 07: If A Peli-Can A Cat Should Not. (2:37). (G. Gross/G. Watson). (Mushroom Music). 08: Granny's Glasses. (3:09). (G. Gross/R. Nobel/G. Watson). (Mushroom Music). 09: The Fire Brigade. (2:17). (G. Gross/G. Watson). (Mushroom Music). 10: The Ghost Of The Cave. (3:07). (G. Gross/R. Nobel). (Mushroom Music). 11: Vote For Me. (2:44). (G. Gross/R. Nobel). (Mushroom Music). 12: The Magic Flute. (4:31). (G. Gross/D. Witt). (Mushroom Music). 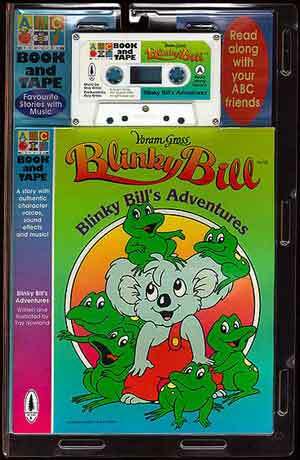 13: Hey, Hey Blinky Bill (Reprise). (2:06). (G. Gross/J. Palmer). (Mushroom Music/YGFS). CA (OP) ABC. ISBN 0 642 17650 7. 1995. "STORIES FROM BLINKY BILL". Produced and narrated by Heather Steen. Adapted and re-written for audio by Sharyn Dee. Featuring music by Guy Gross. S1: Blinky Rescues the Budgie. S2: Blinky Breaks the Drought. CA (OP) ABC. ISBN 0 642 17754 6. 1995. 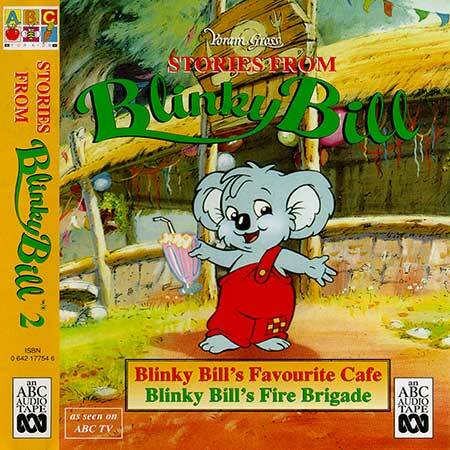 "STORIES FROM BLINKY BILL 2". S1: Blinky Bill's Favourite Cafe. S2: Blinky Bill's Fire Brigade. CA (OP) ABC. ISBN 0 642 17627 2. 1995. "STORIES FROM BLINKY BILL 3". S1: Blinky Bill's Fund Run. 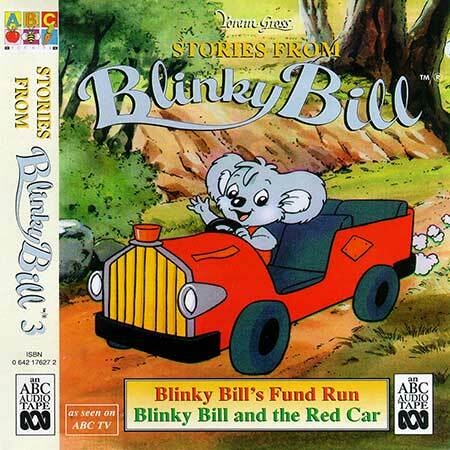 S2: Blinky Bill and the Red Car. CA (OP) Yoram Gross Film Studios. ISBN 187598061-X. 1998. Redwood Audio. Published 1998 by Redwood Audio a division of Hinkler Book Distributors Pty. Ltd. Produced under license from the Australian Broadcasting Corporation. Written and illustrated by Ray Nowland. Music by Guy Gross. Produced by Guy Gross. Book 24 pages. 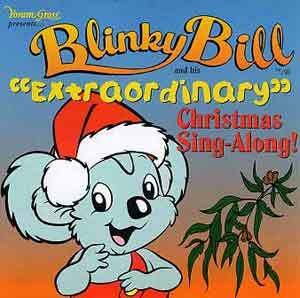 S1: Blinky Bill's Adventures - A.
S2: Blinky Bill's Adventures - B.
CD (OP) Xtraordinary Xperience / Yoram Gross-EMI TV Pty. Ltd. Silver & Ballard. SB CD 100. 1999. Music arranged and performed by ANDREW LEGG. Voice Artists KEITH SCOTT & ROBYN MOORE. Recorded at SONIC SOLUTIONS. Audio Post Production/Sound Design GEORGE GOERSS. Additional Recording TOP SPOTS DIGITAL. Recording Engineer BILL DOWLING. Daisy and the Dingettes/Mouse Choir LOUISE LINCOLN & ROBYN MOORE. Cynthia Python's Burp Coach DANIEL MOORE. Roadie "CROW KOBAINE" GOERSS. Wombo's drum coach STEWART LONG. Writer/Producer ROBYN MOORE. Special Guest Appearance by FATHER CHRISTMAS. Music: Traditional. Arranged and performed by Andrew Legg. Lyrics adapted by Robyn Moore. Traditional. 2:50 Arranged and performed by Andrew Legg. Traditional. Arranged and performed by Andrew Legg. Music and Lyrics by Robyn Moore. Arranged and performed by Andrew Legg. Lyrics by Robyn Moore. Arranged and performed by Andrew Legg. Music and Lyrics by Robyn Moore. Arranged and performed by Andrew Legg. Music by Johan Strauss. Snores sampled and played by Andrew Legg. Music CD. 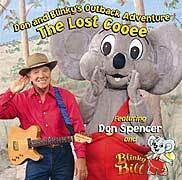 Don and Blinky's Outback Adventure-The Lost Cooee. (Don Spencer and Blinky Bill). 2002. From the stage show called "The Lost Cooee". This soundtrack features songs from the show including "Hand Jive", "Please Don't Call Me A Koala Bear" and "I'm Blinky Bill".